How many have received an IRS letter 12C about a missing Form 8962 on their tax return? The IRS uses LTR 12C (see upper right corner of your letter) to request Form 8962, Premium Tax Credit. It’s required when someone on your tax return had health insurance through Healthcare.gov (or a state Marketplace) and took the Advance Premium Tax Credit to lower their monthly premium. Form 8962 is created by entering your Form 1095-A (received from your Marketplace) in Tax Software. This post can help you enter your 1095-A in your Tax software and create (or correct) Form 8962. You’ll also be able to review an updated page 2 of your 1040 or 1040A for any change to your refund amount or the amount of tax you owe. Reasons why you could be receiving this letter? you didn’t include the Form 8962, Premium Tax Credit, to reconcile the advance payments that were paid on your behalf when you filed your individual 2018 tax return. a copy of the corrected second page from your original return that shows the “Tax and Credits” and “Payments” sections. 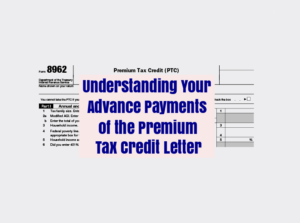 You must complete either the line for “excess advance premium tax credit repayment” (line 46, Form 1040, or line 29, Form 1040A) or the line for “net premium tax credit” (line 69, Form 1040, or line 45, Form 1040A).NOTE: If you originally filed a Form 1040EZ tax return, you must transfer the information from your Form 1040EZ to a Form 1040A and include it with your response. Form 1040EZ does not have the designated lines needed to carry forward amounts from a Form 8962. You should have received a Form 1095-A from your Marketplace on or before January 31, 2019. If you didn’t receive your Form 1095-A, log in to your HealthCare.gov or state Marketplace account or contact your Marketplace directly. The IRS cannot answer questions about the information on your Form 1095-A, reissue missing/lost forms, or issue a corrected form. Do not file a Form 1040X, Amended U.S. Individual Income Tax Return. 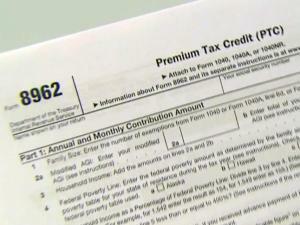 After they receive the requested information, they’ll use it to process your original tax return. If you’re entitled to a refund after reconciling your advance payments, the IRS will finish processing and send your refund about 6-8 weeks after they receive all of the necessary information. How can we respond to the letter? Your Letter 0012C provides a fax number if you want to send the information by fax. If you prefer to mail your response, send the information to the address listed at the beginning of the letter. Also, include a copy of the letter with your response. Where can I get form 8962? Download a copy of Form 8962 from the IRS website. If the taxpayer’s advance credit payments are less than his or her premium tax credit, the taxpayer will get the benefit of the increased tax credit. You’ll receive a Form 1095-A when you or a family member enrolled in health insurance coverage through the Health Insurance Marketplace. Form 1095-A provides the information you need to complete Form 8962. If you or your family members enrolled in the Marketplace in more than one qualified health plan policy, you’ll receive a Form 1095-A for each policy. Check the information on your Form 1095-A carefully. Please contact your Marketplace if you have questions about its accuracy.